We all know by now that the stereotype of the solitary, basement-dwelling video game nerd is the stuff of fiction. Gaming communities have always existed, but the rise of the Internet has allowed for increasingly complex and direct communication between players and developers. This week, we use Leigh Alexander's piece on Eve Online to start a conversation about community management in modern games. We also take a look at Brandon Boyer's article about Infinity Ward's Twitter-based suggestion box for the next Call of Duty: Modern Warfare game. Of course, no discussion about community would be complete without your feedback, so please don't hesitate to jump in via comments or email! 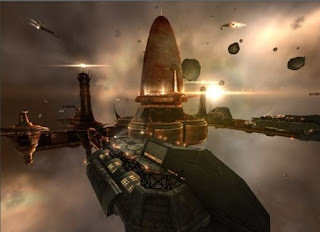 -How involved are you in large scale community games like Eve Online? What drew you to the community and why do you think it was successful? -Players: How (if at all) do you interact with game developers? Do you post on message boards, send emails, or just vote with you wallet? Developers: What are the most effective ways of gathering feedback? -In today's world of downloadable content and game patches, is there a danger of developers over-reacting to complaints from a vocal minority of players? -Leigh Alexander's article about Eve Online: "Interview: CCP's Tinney On How EVE Keeps Growing"
-Brandon Boyer's article about Infinity Ward's use of Twitter: "Call of Duty creators Infinity Ward launch their Twitter suggestion box "
-Steven Totilo's article about Gabe Newell's DICE 2009 talk: "DICE 2009: The Very Different Gaming World Gabe Newell Wants"